New Book: "Postmetaphysical Thinking II"
"There is no alternative to postmetaphysical thinking". Postmetaphysical thinking is, in the first place, the historical answer to the crisis of metaphysics following Hegel, when the central metaphysical figures of thought began to totter under the pressure exerted by social developments and by developments within science. As a result, philosophy’s epistemological privilege was shaken to its core, its basic concepts were de-transcendentalized, and the primacy of theory over practice was opened to question. For good reasons, philosophy "lost its extraordinary status", but as a result it also courted new problems. 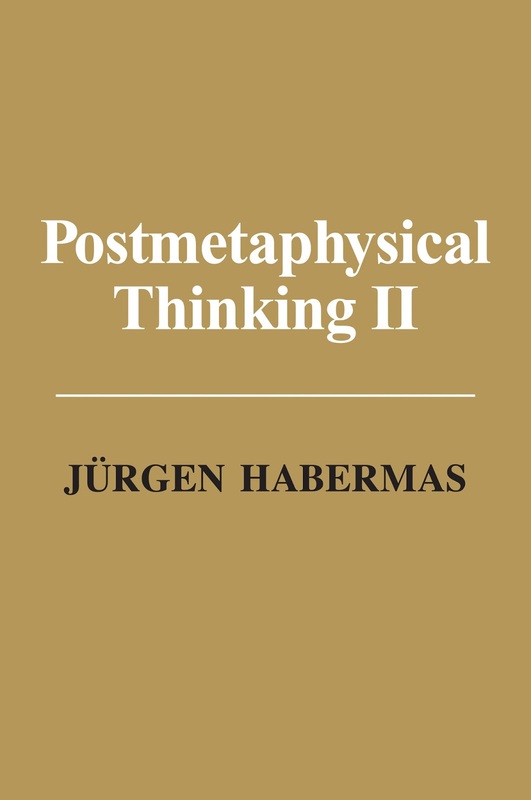 In Postmetaphysical Thinking II , the sequel to the 1988 volume that bears the same title [English translation 1992], Habermas addresses some of these problems. The first section of the book deals with the shift in perspective from metaphysical worldviews to the lifeworld, the unarticulated meanings and assumptions that accompany everyday thought and action in the mode of "background knowledge". Habermas analyses the lifeworld as a "space of reasons" – even where language is not (yet) involved, such as, for example, in gestural communication and rituals. In the second section, the uneasy relationship between religion and postmetaphysical thinking takes centre stage. Habermas picks up where he left off in 1988, when he made the far-sighted observation that "philosophy, even in its postmetaphysical form, will be able neither to replace nor to repress religion", and explores philosophy’s new-found interest in religion, among other topics. The final section includes essays on the role of religion in the political context of a post-secular, liberal society. Translation of "Nachmetaphysisches Denken II" (Suhrkamp Verlag, 2012). See my blog post on the German edition here. Essay 5: In Craig Calhoun, Eduardo Mendieta and Jonathan VanAntwerpen (eds.) - "Habermas and Religion" (Polity Press, 2012) pp. 347-390. Essay 7: In Eduardo Mendieta & Jonathan VanAntwerpen (eds.) - "The Power of Religion in the Public Sphere" (Columbia University Press, 2011) pp. 15-33. Essay 8: In "European Journal of Philosophy" vol. 18 no. 3 (2010) pp. 443-453. Essay 9: In James Gordon Finlayson & Fabian Freyenhagen (eds.) - "Habermas and Rawls: Disputing the Political" (Routledge, 2011), pp. 283-304. Essay 10: In Jürgen Habermas - "Europe: The Faltering Project" (Polity Press, 2009), pp. 59-77. "The collection of essays published in 1988 under the same title as the present collection dealt with the self-confirmation of philosophical thinking. This remains the theme of the present collection." "Hume and Kant mark the end of metaphysics. Philosophy no longer insists on its Platonic route to salvation through contemplation of an all-encompassing cosmic unity, so that it no longer competes in this regard with religious worldviews. The nominalist revolution paves the way for liberating philosophy from the embrace of religion; it now claims to ground morality and law, and the normative content of modernity in general, in reason alone. On the other hand, the critique of a false scientistic self-understanding of philosophy can highlight the fact that it cannot be reduced to science. In contrast to the objectifying sciences, philosophy still shares with religious and metaphysical "worldviews"" the self-reflexive attitude in which it processes mundane knowledge. It is not directly involved in increasing our knowledge of the world but asks instead what the growing body of empirical knowledge, the knowledge we acquire through interactions with the world, means for us. Instead of being reduced to the role of an auxiliary of cognitive science, for example, philosophy should continue to pursue its task of articulating a justified understanding of ourselves and the world in the light of the best available scientific evidence. There is no reason to question the secular character of postmetaphysical thinking. (....) For philosophy, "linguistification" [of the sacred] can only mean discovering the still vital semantic potentials in religious traditions and translating them into a general language that is accessible beyond the boundaries of particular religious communities - and thereby introducing them into the discursive play of public reasons."